I think they look like salad tongs. My husband thinks they're instruments of torture. Some variation of hoof testers has probably been around since people have been using horses for work. Okay, now I've exhausted MY knowledge. Fortunately there is a wonderful article on the subject of hoof testers -- the kinds of hoof testers, how to use them, what they reveal, and their role in diagnosing lameness -- all from an experienced farrier. 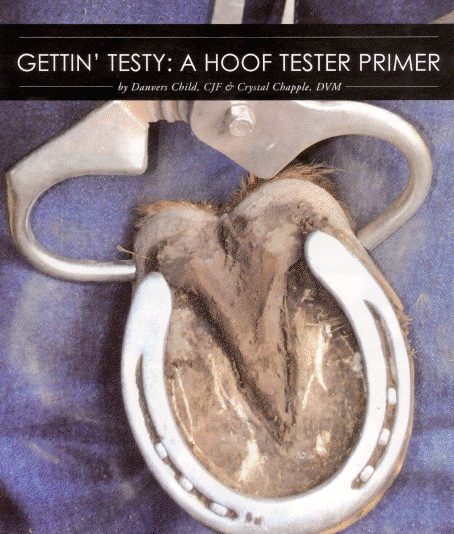 Hoof testing description from Equine Podiatry by Andrea Floyd Szabuniewicz M. Use of the hoof tester in diagnosing lameness in horses. Vet Med Small Anim Clin. 1975 Feb;70(2):205-12. Gettin' Testy: A hoof tester primer by Danvers Child and Crystal Chapple. American Farriers.org. When Final Call had his pre-purchase exam last week, the vet used hoof testers. The right front came up sore, but he flexed and trotted sound. Vet tested again - nothing. It was very odd. He suggested the horse was just nervous about the testers. I really question their value.